The group Partido Manggagawa (PM) demanded stronger labor and safety enforcement from the Department of Labor and Employment (DOLE) in the wake of the massive factory fire at the Cavite EPZA that resulted to some one hundred injuries and one confirmed dead as of today. “Export zones should not be independent republics where weak labor and safety rules lead to low wages, proliferation of contractualization and unsafe working conditions. The DOLE should exercise its labor enforcement and inspection powers to the full within economic zones. 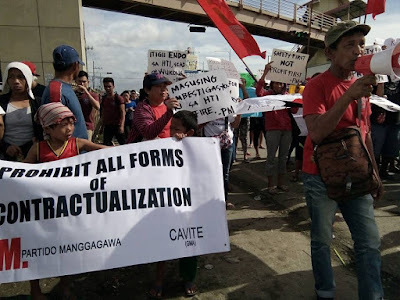 A big number of the country’s factory workers are now employed in the numerous export zones across the country and especially Calabarzon,” argued Rene Magtubo, PM national chair. Yesterday members of PM and the Katipunan ng Manggagawang Pilipino (KMP) trooped to the Cavite EPZA to demand a transparent investigation of the factory fire at House Technology Industries (HTI) and immediate assistance for workers injured or killed in the industrial tragedy reminiscent of the Kentex fire in 2015. “We express our sympathies for HTI workers and their families. Accidents are not acts of divine providence that can be dismissed as unavoidable. Instead, accidents are the result of unsafe acts and therefore preventable by strict enforcement of occupational safety and health and labor standards,” Magtubo insisted. He noted that despite HTI’s compliance certification, there are apparent occupational health and safety issues since there was a previous fire at HTI in 2012. A 10-hour fire started at the boiler department of the HTI factory in October 19, 2012 and lasted up to early the next day. “Also we are gravely concerned that out of HTI’s total workforce of some 10,000, only 4,000 are regular workers and the rest are contractual workers deployed by several agencies. Labor inspection should reveal if these agency workers are actually doing the job of regular workers but are being used to evade implementation of mandated wages, benefits and rights,” Magtubo elaborated.